This review was pending a long time now, and really it’s been a long time since I’ve done any review (office and family taking the front row these days)!! Well it’s a dog’s life as they say, so have to live with it. Last month, Suzuki delighted us by giving us the Suzuki Bandit and the Suzuki GSX-R1000. During the 7th Anniversary G2G of XBhp, I got a chance to get to know the Bandit up close and personal. Well, every time I see such an exotic machine, I don’t look it like a machine, I look it as if I’m trying to woo a lovely lady, sometime flirting, sometime being poetic and all for that final ride astride. Being technical is easy, but being able to connect with the psyche of the machine gives a whole new perspective to every aspect of the machine. Ever since the Bandit was launched way back in 1995, the Bandit has carved a niche amongst tourers for its relaxed and comfortable riding and that’s exactly are the aspects to woo for this lady apart from the lovely lines and contours she has. Starting from the head lamp to the tail lamp, the bike boasts of some of the finest design patterns you would be seeing on any bike of this class. The 2010 fully faired version of the Bandit looks even better, but yeah the 2009 version lags no behind. She looks chubby, succulent and very warm hearted and welcoming. Get astride her and you are seated on one of the most comfortable seats on two wheels around. They are so comfortable that they tend to spoil you. Boy they are more comfortable than the seats of my Pulsar 200. That’s exactly when the lovely lady starts flirting with you… inviting you to key her on and get involved in a lustrous journey which would surely leave you wanting for more. If you find your height too much to miss the fun, or just that tad bit short to grab her along… well the seat height is also adjustable to some extent. We all love to see our big machines on sides, like a red hot J’Lo standing wicked with her hand on her hip. But even a red hot J’Lo would find it tough standing like that for long, in Indian conditions. So, keeping that in mind, Suzuki decided to go for a center stand for the Bandit making the bike even more suitable for Indian conditions. So, what’s the use of wooing such a lovely lady, without going out for a date with her through the long open stretches, through the scenic twisties, standing alongside her and looking over the clouds as the Sun goes down behind the icy peaks of the Himalayas!! Here I would be getting a bit technical because that’s what matters when you start describing the Bandit from the performance stand point. The specs are pretty straight and prove the practicality of the bike right on your face. If you are a crouched back speed junky, then just stay away from it, but if you are one of those weekend riders who just love to pack their bags every weekend to take a ride here and there, then this machine is simply a grand fest of boundless pleasure on saddle. With the 4-stroke inline 4 mill under pumping out a max of 97bhp of peak power, it’s easily beats hands down any 1.2L 4 wheel mill currently available in India under the Hatchback umbrella. As if this was not sufficient, so Suzuki offers a meaty torque of almost 108Nm coming at 3500 rpm from where the bike pulls cheerfully to the red line. But as bikers we all know that when riding the bike off track, it’s never about the red line, but it’s always about the usability of the bike in different riding conditions, be it bumps, be it wet tarmac, be it stop and go traffic. It’s exactly here where the peak power and torque combo wins the situation for you. Its way more manageable and practical for Indian conditions, conditions were the inevitable is just at every corner. Couple with the upright seating and the adjustable seat height ensures that given a bad twist in the tale, the movie does not out of control of the director and you are the final person to say CUT and not the twist. It’s not like that in this bosom elopement you won’t encounter traitorousness and when it comes to the brakes and the rubber setup of the machine, you need to be a bit extra careful. With a weight of 229 kg, the bike has all the ingredients if the brakes and the rubber don’t treat your well. Internationally it has been found that they are not the best in class in stock and they have immense scope for improvement. Even though I’ve not ridden it as of yet, but this is what I could gauge from the reviews available. 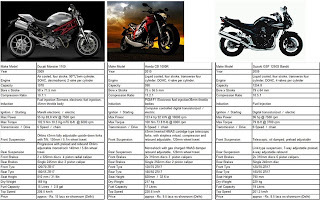 Well if you look at the current CBU market, then the Suzuki Bandit two competitors (I’m considering engine capacity, power and torque band) in the name of the Ducati Monster 1100, Honda CB 1000R. Clearly, the Ducati is the red hot Megan Fox straight from Transformers 2 and is for a very select few who don’t mind shelling out extra to be in the company of this exotic. Look wise a scorcher, but performance wise fall in the same genre as the other two and that’s where the average Indian mentality kicks in and says bro… it’s a bit too much. This brings us to the lady in question, the Suzuki Bandit, cute and cuddly Kate Winslet from Titanic, adorable, gracious and subtle. The fact that makes the Bandit a winner amongst the three is the price tag – at approx Rs. 8.5 lacs ex-showroom (Delhi), you can’t get a more complete package than this. But at the same time, the Honda CB1000R is very close up the heels of the Bandit and claims to be a real competitor. The 2009 Suzuki Bandit has all the ingredients set to get busy in some serious relationship, and it’s really up to you, how you want to keep that relationship going, you want to use the bike for daily commuting and keep the relationship noble or you want to get lustrous every weekend, Bandit is all live and kicking. Did you get to listen to that engine rev? Yeah I did rev the engine on, and it's a classic In-Line four sound that it makes. I also had the opportunity to watch the Bandit 1250S from close quarters recently. The exhaust note of the Bandit 1250S is the smoothest that I have ever heard from any inline four till date. Yup, it's smooth. Even Honda CB1000R has quite a smooth exhaust note!! How can you not compare Yamaha FZ1 to this bike? 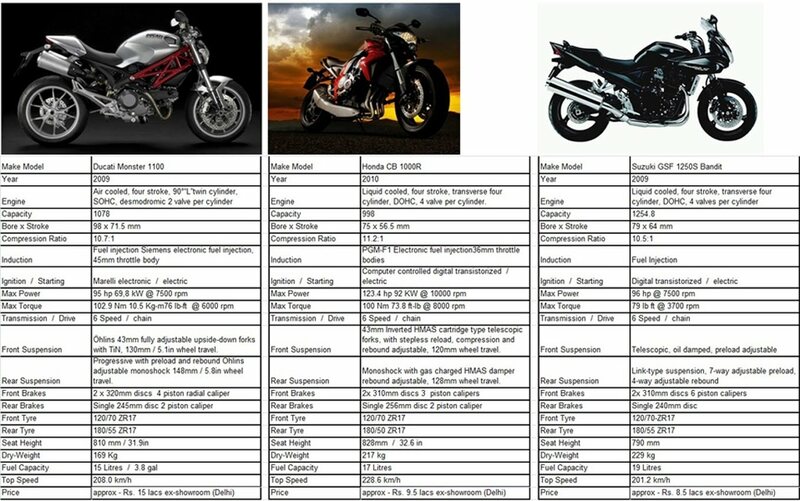 Its 20 times more similar than either of the bikes you compare it to. That's because Yamaha FZ1 was not officially launched in India at the time the post was written. Also, the Yamaha FZ1, in my opinion, is more similar to the Monster and the CB1000R than to the Bandit when you consider the design cues and the performance and as a matter of fact, the FZ1 is probably the most radical one in the lot.